Pedro Munhoz Defeats Cody Garbrandt Via KO In A Wild Brawl! The Bantamweight match between the former UFC 135-pound king Cody Garbrandt and the former RFA champion Pedro Munhoz is kicking off the main card of UFC 235 PPV (pay-per-view) event tonight (Saturday, March 2, 2019). It happens inside T-Mobile Arena in Las Vegas, Nevada. The referee in charge for this contest is Marc Goddard. Let the war begin! Fighters trading shots. Cody goes for one-two combination, we’ve seen a great strike. Fighters missing low kicks. Munhoz misses a low kick. Garbrandt connects with great shots. Good knee from Cody Garbrandt. Superman punch “No Love”. Good left hand from Cody. Low kick Munhoz. Great combo Cody Garbrandt, his rival misses with a low kick. Garbrandt misses to the body. Good punch combo by Cody. 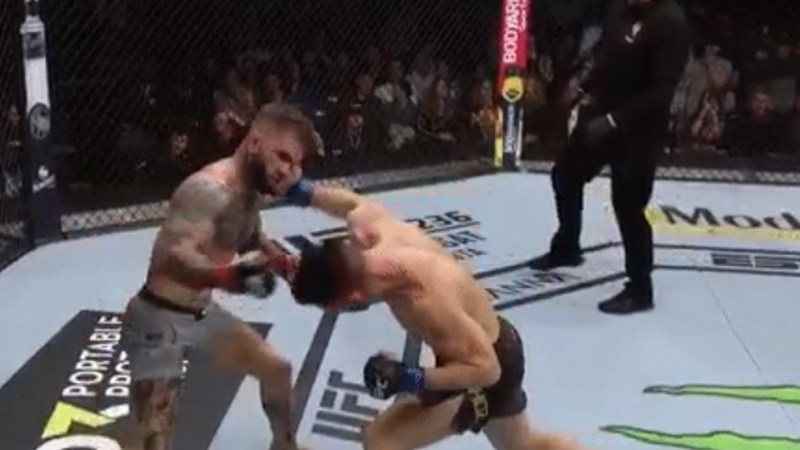 Wow, this hand to hurt, spinning back kick to the body Munhoz, Garbrandt looked wobbled but he recovered. Garbrandt misses with a body kick. What a left hand by Munhoz, and Cody is wobbled. His rival ends up in the full guard, rains punches. Garbrandt stood up, fighters continue trading punches, this turns into a wild brawl, what an exchange, we’ve seen more than 20 punches. Excellent punch by Munhoz, what a knockout, Cody went down like a sack of potatoes! Munhoz attacks! That’s it, the referee stops the fight! Cody Garbrandt is KOd!!! The hook ended the match, victory for Pedro Munhoz!!! Oh my goodness!!!!! @UFC that was just nuts!!!! How fricking crazy!??? Cody Garbrandt drops to 11-3 MMA, 7-2 UFC, Pedro Munhoz improves the score to 18-3, 1 NC MMA, 8-3, 1 NC UFC.